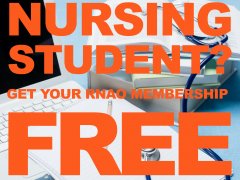 If you are an Ontario nursing student studying in a bachelor's degree program (including RPN to RN bridging programs and accelerated types of bachelor's degree programs) you can join RNAO for absolutely no charge. Let your fellow undergraduate students know that RNAO membership looks impressive on a resumé and catches the eye of many employers. To take advantage of this limited time offer, simply go to myRNAO.ca/join. Under the "Membership Category" drop-down menu, choose "Undergraduate Nursing Student Associate". Sign up by 11:59 p.m., Oct. 31, 2018 to guarantee your complimentary membership.